And what of Nature Photography? When Finninsh photographer Esko Männikkö won the Deutsch Börse Photography Prize in 2008, an article by the Guardian posed a significant question; “Will this bring wildlife photography into the mainstream?” It is interesting to reconsider such a query in light of this year’s Deutsche Börse finalist Jochen Lempert and his installation of black and white images of the natural world. Männikkö, a self-titled “photographer of fish, dogs, and old men,” won the prestigious £30,000 prize, awarded by the The Photographers’ Gallery in 2008 for his collection of up-close, animal portraits. Strangely, his images are somewhat reminiscent of Robert Mapplethorpe’s studies of the human form, examined at such magnified and unusual angles that its features are abstracted into almost unrecognisable entities. Whereas Mapplethorpe seems to distance them from their association with the human form, the isolated features of Männikkö’s animals take on almost anthropomorphic qualities in their depiction. Their subtleties convey, or perhaps are simply imbued with on our examination, a sense of relatable personality; an open mouth becomes a lopsided grin, the dark pit of an eye becomes filled with inquisitive wondering. 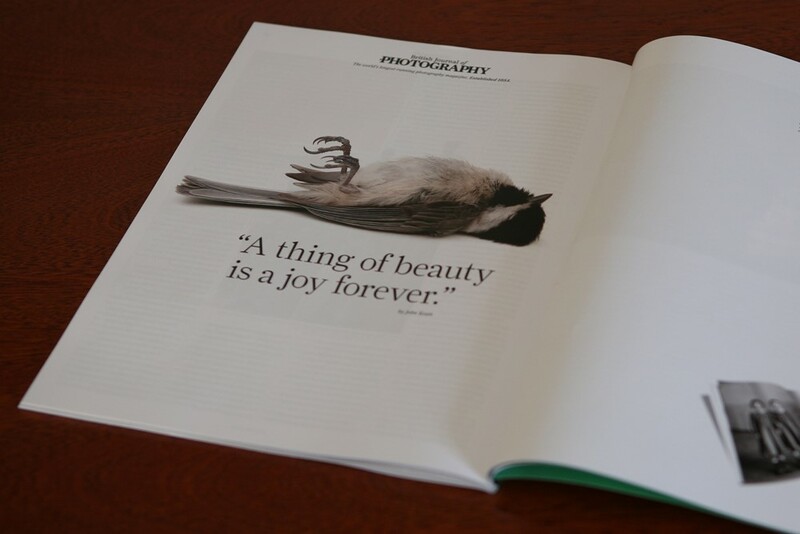 The 2008 Guardian article in question asked if Männikkö’s acclaimed success meant that a reassessment of the “decidedly un-mainstream, often-derided pursuit” of animal and wildlife photography would follow. There are various genre specific competitions, the Wildlife Photographer of the Year and British Wildlife Photography Awards, where talent is recognised and commended. Yet, in non-genre specific photography, how much critical attention does it receive? This is reflected in an academic blog post, whose author shared an advert of the British Journal of Photography that triggers such questions. Niall Benvie, a prolific writer on natural history photography, argues that the European art establishment is “blinkered;” exclusively anthropocentric in its evaluation. “If it fails to comment on the human condition, it is inadmissible, dismissed as sentimental.” While much photography seems to posit itself around the pursuit of self-expression, and ultimately self-discovery in relation to the viewer, nature photography tends towards a preoccupation with the subject itself rather than alluding to the sentiments of a shared human experience. The Wildlife Photographer of the Year images provide us with fascinating, detailed visions of the habitat and behaviour of wildlife, often exotic, that we don’t have the chance to witness. Promoted by the Natural History Museum and the BBC, winning submissions are selected for “their artistic composition, technical innovation and truthful interpretation of the natural world.” Truthful depiction is seemingly an irrevocable consideration in wildlife photography, highlighted in the disqualification of 2009’s winning shot by José Luis Rodriguez, “Storybook Wolf,” when it was discovered that the apparently wild animal leaping over a fence was in fact tamed and hired to stage the shot. Ultimately then, at the heart of nature photography is the desire to reference; to reveal what a natural entity looks like in its true form. Arguably, other forms of photography do not seem to postulate truth as a prerequisite in the same way. Despite manipulation or staging, photographs can still ignite understanding and sentiment in viewers, by reason of the shared experiences of humanity and our ability to relate the sorrow, joy or longing of the image’s subjects to our own experiences. Such similarities between viewer and subject are not as easily discerned in depictions of the natural world – one we believe ourselves to be very much distinct from. This is perhaps why images such as Männikkö’s anthropomorphic animal portraits have gained such critical recognition, creating an intimate exchange of commonality despite their impenetrable otherness. 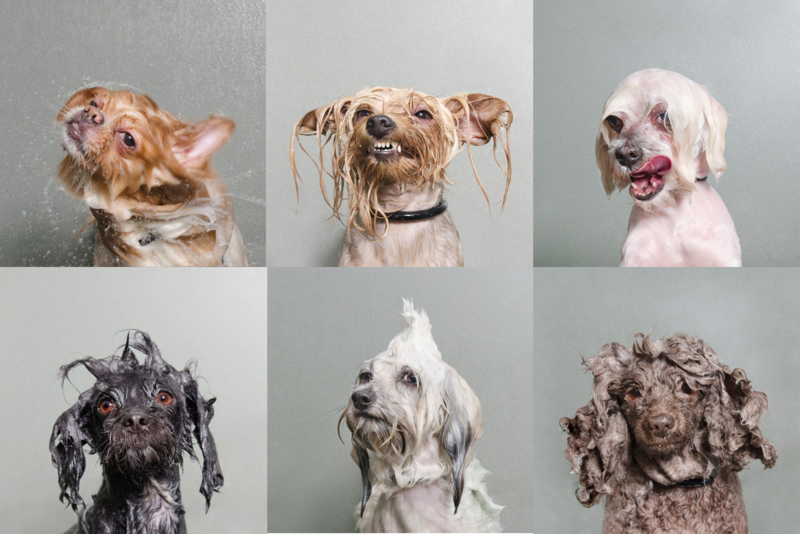 This year’s SONY World Photography Awards selected Sophie Gamand as the winner of the “Portraiture” category, not for a collection of human faces but of animals in her “Wet Dog” series. Gamand’s canine subjects are interjected with human-like characteristics, not merely from their appearance in a genre of photography predominantly associated with human subjects, but through their humorous facial expressions, to which we attribute boredom, enjoyment or even a hint, ridiculously, of smugness. Yet although our first thought may be to associate these “grooming sessions” with the human pastime of hairstyling, we are also reminded of the grooming that takes place within the natural world, amongst primates or lions with their cubs. Brett Rogers, Director of The Photographers‘ Gallery, has commended this year’s Deutsche Börse finalist Jochen Lempert for “drawing our attention to anthropomorphism.” Perhaps more subtle than the previous examples, Lempert interlaces fragmented visions of the man-made world with those of the natural world, as a grasshopper attempts to take a sip from a glass and a deer wanders casually along a cobbled road. Not only do such images invite us to consider the relationship between the two, they also raise complex questions as to what value we, as viewers, derive from photographic representations of the world. If we seek self-referential elements within the frame, perhaps this is insight into why images that fastidiously document the foreign activities of animal life fail to ignite as much popular, critical response. Many of Lempert’s images do not make such explicit associations between man and nature, but instead restrict the intricate details of the natural world to his frame. Images of everyday, often unnoticed, visions are imbued with curiosities as he isolates their ambiguous patterns and obscure shapes. His approach is reminiscent to that of Edward Weston, who held a romantic, almost philosophic regard for natural forms. The serenity and intricate beauty of the natural world is presented as a case for artistic wonder and, although we may not see ourselves in their images, the sensation they ignite within us triggers a respectful admiration that can lead towards reflection on our place within it. Such considerations are crucial, now more than ever, as environmental concerns rise and near-extinction lists grow longer. Perhaps the photographic medium will play a key role in helping disseminate awareness of these issues, not simply in the form of factual documentation but as poetic, compassion rendering works of art, commended by the public and professional bodies alike.